FRONT ROYAL, Va. (CNS) — Above the hum of the table saw, one story was told, then another. As the dark chestnut boards were fixed together, gradually taking shape as a sturdy rectangular box, three brothers pieced together memories of a life. “Something rich and beautiful happens when your hands are occupied but your mind is free,” said Michael Schmiedicke, a web developer-turned-woodworker with a unique side ministry: casket-making. 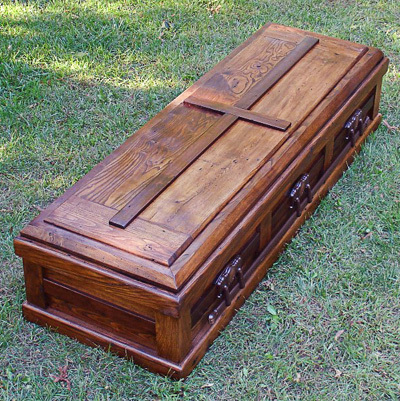 At times, he helps clients build a casket for their loved one themselves. The ministry was born about six years ago amid sawdust and tears, when Schmiedicke and two of his younger brothers made a casket for their grandmother. Schmiedicke’s small woodworking business is, in many ways, an embodiment of new perspectives — on the past, on the old and on the discarded. Located down a gravely road near the Shenandoah River, his Strong Oaks Woodshop was a onetime poorhouse and railway depot, and during World War II, the building was a warehouse for airplane parts. Foreshadowing the current work between its walls, it first served as a furniture manufacturing facility after the Civil War. Strong Oaks employs around 10 people, who with Schmiedicke create by hand everything from bed frames and chairs to bar stools and kitchen tables from reclaimed wood. The company dismantles wood from old houses, barns, warehouses and other abandoned structures slated for demolition. 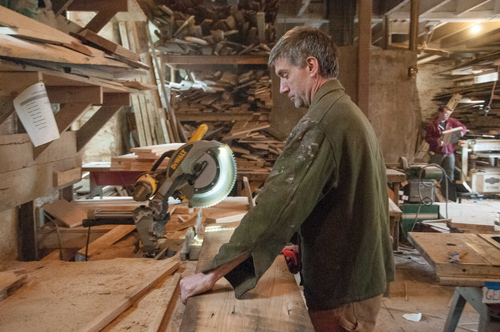 Primarily salvaging lumber from the Shenandoah Valley, Schmiedicke has traveled as far as New York and Michigan to rescue buildings that otherwise would be bulldozed or burned. Most of the buildings Strong Oaks dismantles date back more than 100 years. In the Shenandoah, the old buildings were made from red and white oak, heart pine and wormy chestnut. Sometimes hickory, red elm and maple were used. “You don’t see wood like this any longer,” said Schmiedicke. In some instances, the trees have become so rare that their wood has nearly vanished from the commercial market. A blight before the turn of the century crippled the American chestnut, also known as wormy chestnut, and carbon monoxide pollution affects the growth of a variety of species, said Schmiedicke. “You have the same species, but they aren’t the same as those used in the old structures,” he said. Schmiedicke inherited his love for woodworking from his German grandfather and great-grandfather, and after teaching himself the craft, it regularly served as his “therapy hour” after work and on weekends. With a master’s in library and information science, Schmiedicke has worked as a government contractor; a research librarian for Human Life International, a Catholic pro-life advocacy organization in Front Royal; and most recently as a web developer. As he started spending additional hours tinkering with wooden creations for friends and family, including his four children, he grew “less motivated to maintain interest in the next web development language,” he said. It took several years juggling both web development and woodworking, but eventually he was able to commit to his passion full time. Amidst Strong Oaks’ growing success, Schmiedicke’s mother asked if he’d be willing to make a casket for his grandmother. “I was deeply moved by the request,” he said. And, though he’d never made a casket before, he and his brothers set to work building one. While they worked, Schmiedicke, the eldest of 11, shared memories of the crazy adventures he’d had growing up with uncles and cousins in his grandmother’s house. His brothers told stories about what it was like caring for their grandmother as she grew older and her Alzheimer’s progressed. Thus began the small side endeavor of his Strong Oaks business — offering families the opportunity to make a casket with his help. Or if they desire, he builds one on his own according to a family’s specifications, including special details such as a Celtic cross or inscription. Schmiedicke now makes around a half-dozen caskets a year, but he hopes to increase that amount in the future. His company’s website, http://strongoakswoodshop.com, highlights various pieces of furniture made there. “The bar stools pay the bills, but if I can slip out from work now and then to make a casket … that’s what I’d like to do. It’s personally very meaningful work to me,” he said, adding that he sees the work as a ministry.